By James Mathison and Mateusz Mucha. Why use the body surface area calculator? The BSA calculator allows you to easily find your body surface area (BSA), which is the external surface area of the human body given in square meters. Knowing how to calculate BSA is useful in medicine and physiology since it is a more accurate indicator of metabolism than body weight. That's why many doctors base their prescriptions on the BSA formula. There are many formulas which can be used to calculate body surface area. Our BSA calculator uses the most commonly used Du Bois formula in the simple mode and many others in the advanced mode (Mosteller, Haycock, Gehan and George, Boyd, Fujimoto, Takahira, Shuter and Aslani and Schlich separately for men and women). They are all based on your weight and height, let's take a look at two of them. where BSA is measured in square meters, weight in kilograms and height in centimeters. Our tool lets you easily use other units, though. All the formulas are taken from the Body Surface Area article in Wikipedia. If you are 170 cm tall and weigh 60 kg, the approximate calculation of your body surface area is 1.67 square meters. Some medical practitioners prefer other BSA formulas. For example Haycock, Gehan & George, and Boyd. Luckily for you, there's no need to count your BSA on your own. You can work it out much more easily by using the body surface area calculator. Thanks to this tool you can find out how big your body would be if it was a flat area. Although the calculator is based on the same complicated equations, it is simple to use and only takes a few seconds if you already know your height and weight. 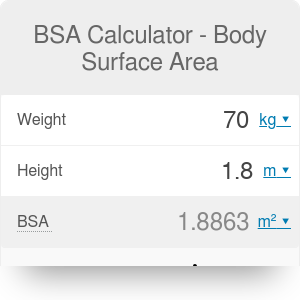 It is much easier to calculate body surface area if you use our BSA calculator. This tool needs only your weight and height to solve the equation. After plugging in these two values, you automatically get a result. With these measurements, your body surface area equals about 1.69 square meters. If you are going to calculate your BSA, it's good to know the average values. Obviously they depend on the age and gender. If you are interested in different measurements related to your body, you should also check our BMI calculator . This is a tool which helps you know if your weight is in a healthy range or not. Another calculator you might find useful is surface area calculator. James Mathison and Mateusz Mucha. BSA Calculator - Body Surface Area can be embedded on your website to enrich the content you wrote and make it easier for your visitors to understand your message.